Multiparameter Patient Monitoring Market to Hit $11 Billion by 2025: Global Market Insights, Inc.
SELBYVILLE, Del., February 13, 2019	(Newswire.com) - China multiparameter patient monitoring market is estimated to grow at 4.8% from 2019 to 2025. According to the World Health Organization (WHO), over 230 million people in China have cardiovascular diseases and it is predicted to increase up to 50% by 2030. Growing prevalence of cardiovascular diseases has supported the market development in China. Moreover, increasing healthcare expenditure to invest in developing new technology will promote industry growth. 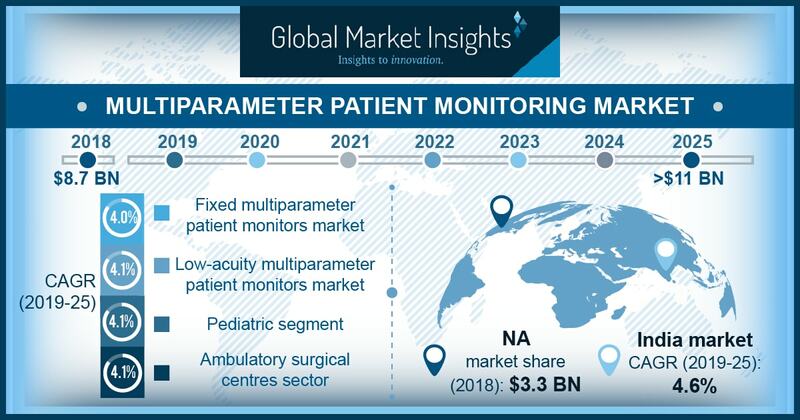 Global Multiparameter Patient Monitoring Market is expected to surpass USD 11 billion by 2025; according to a new research report by Global Market Insights, Inc., increasing geriatric population suffering from chronic diseases and requiring critical monitoring will surge demand of multiparameter patient monitors devices rendering positive impact on industry growth. According to WHO, the world’s population over 60 years will double from 12% to 22% between 2015 to 2050. Majority of the geriatric population suffers from chronic ailments. For instance, the prevalence of heart diseases is high due to diabetes in elderly people. Multiparameter monitoring devices are highly preferred as they provide accurate monitoring results. Thus, high adoption of such superior quality multiparameter patient monitoring devices in treating the geriatric population will augment the industry growth. Portable monitors will witness 3.8% growth from 2019 to 2025. Portable multiparameter monitors developed by key industry players have improved accuracy and enable rapid recovery. These technologically advanced portable devices are useful in ambulances and clinics as mobility of monitors proves beneficial for patient monitoring. Also, high preference for portable multiparameter patient monitors in elderly population base will further drive the segmental growth. Aforementioned factors along with operational ease possessed by portable multiparameter monitors surges the segment growth. High acuity level segment held 43.8% market share in 2018 and it will show lucrative growth during analysis timeframe. Technological advancements that have enabled monitoring patient’s health on multiple parameters will drive high acuity segment growth. Also, wireless network for such monitors reduces clutter of wires in ICU. Further, monitors also provide alarm notification under critical situations and hence, such technological integrations in high acuity patient monitoring devices foster the segmental growth. Pediatric patient monitoring segment valued at 2.3 billion in 2018 and it will have enormous growth during analysis time frame. According to CDC, congenital heart defect is the most common birth defect and over 40,000 babies get affected by CHD every year in U.S. Rising number of complications in newborn babies and increasing incidents of cardio-respiratory problems in pediatric patients will increase the demand for multiparameter patient monitoring systems. Key industry players in the market include Epsimed, KizlonMedical, Mediana, Medion Healthcare, Medtronics, Mindray, Masimo, Opto India, OSI Systems, Philips Healthcare, Skanray Technologies, Spacehealth Labs and VOTEM. Prominent industry players adopt strategies including acquisitions, mergers, distribution agreements and innovative product launch to strengthen product portfolio and garner higher market share. For instance, in November 2018, Mindray launched BeneVision N1 Patient monitor, with enhanced data analysis that improves patient monitoring. Introduction of new products will foster company’s revenue generation. Global Patient Handling Equipment Market exceeded USD 11.0 billion in 2017 and is expected to witness growth of around 11.2% CAGR from 2018 to 2024 owing to rising number of regulations and guidelines to ensure safety of healthcare workforce against manual lifting. Patient Temperature Management Market size is projected to experience substantial growth from 2017 to 2024. Availability of technologically advanced products along with rising demand for surface cooling and warming systems will fuel patient temperature management market growth.